Ankur and I move to Ahmedabad earlier in October. Since then, we have been trying to settle into our new place and haven’t spent much time exploring the new city. Well, now everything is in place. Our house is set up well, the kitchen is up and running and Ankur has settled into his new work place. We now have time to explore Ahmedabad and it’s surroundings. 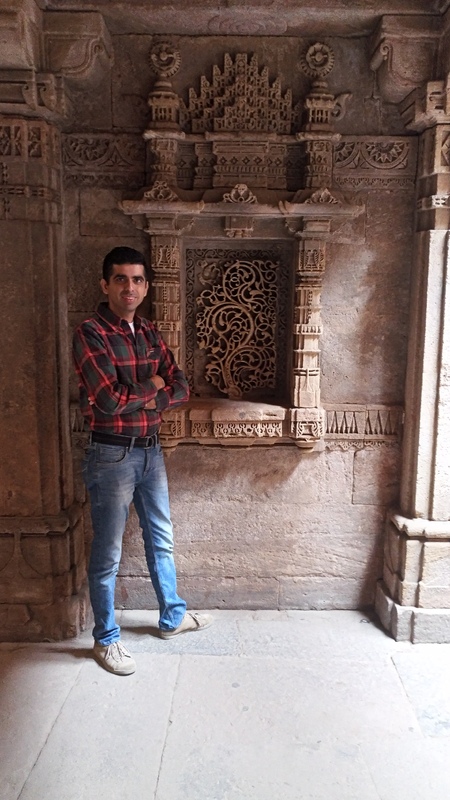 To get the ball rolling, we decided to visit the Adalaj step well, which is located about 25 km away from Ahmedabad, towards Gandhinagar. The place was perfect to spend a couple of hours in late afternoon. The symmetry and architecture of the place… the angular columns, one behind the other, reminded me of the Angkor Wat. The construction of the Adalaj Step Well commenced under the rule of the Rana Veer Singh, the king of Adalaj. However, during the construction phase, Rana entered into war with a neighbouring king Mehmud Begada. Rana lost the war and the kingdom fell into the hands of Mehmud Begada. Dana’s wife, Rudabai, was known for a beauty. Mehmud fell in love with her and wanted her to be his Queen. 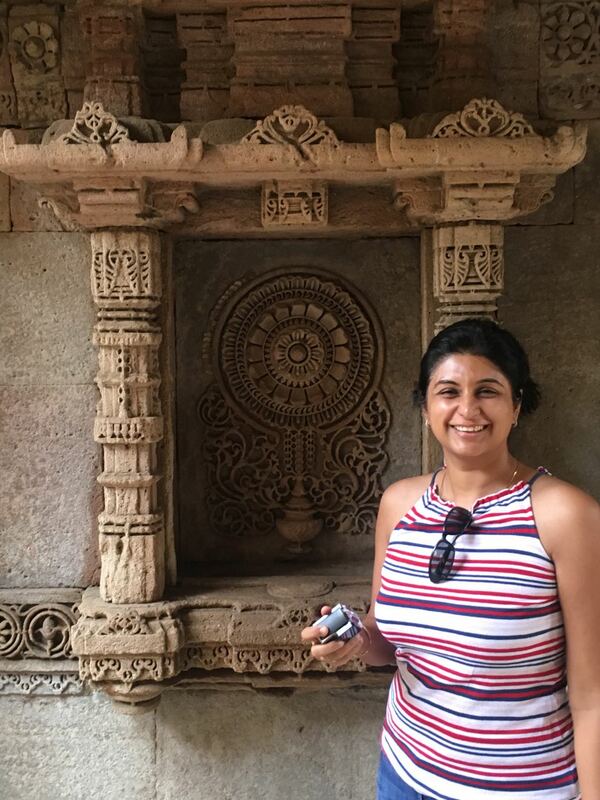 Rudabai said that she would marry him after the construction of the step well is completed, her prime intention was to see completion of the task that her late husband had commenced. 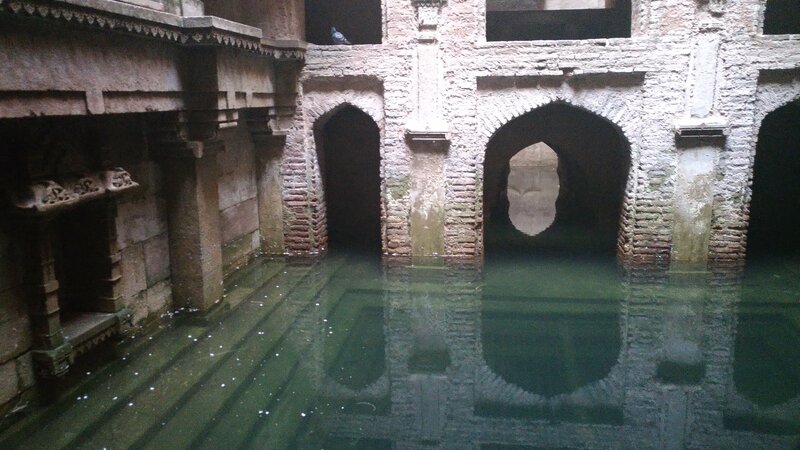 Mehmud agreed to the condition and the Adalaj Step Well was ready by 1499. However, Rudabai jumped into the well and gave up her life, not wanting to remarry… a tragic ending to the story! 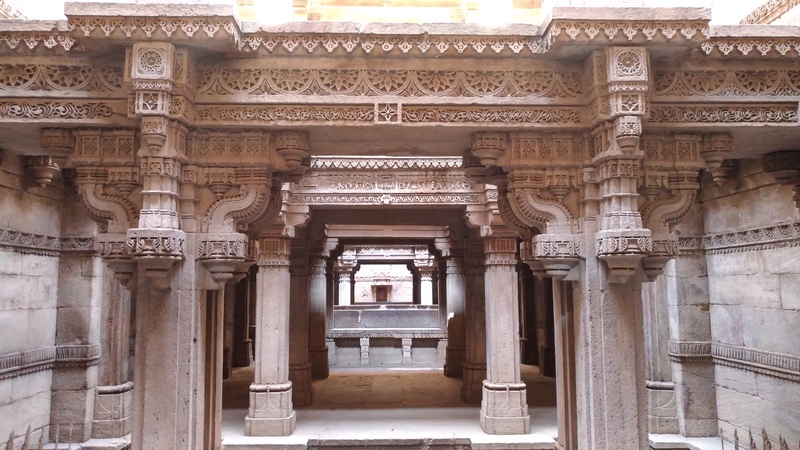 Here are some pictures of the Adalaj Step Well, along with some interesting facts to spike your interest in the monument. The well is octagonal in shape and has five storeys. The opening in the ceiling allows natural light to enter the structure. 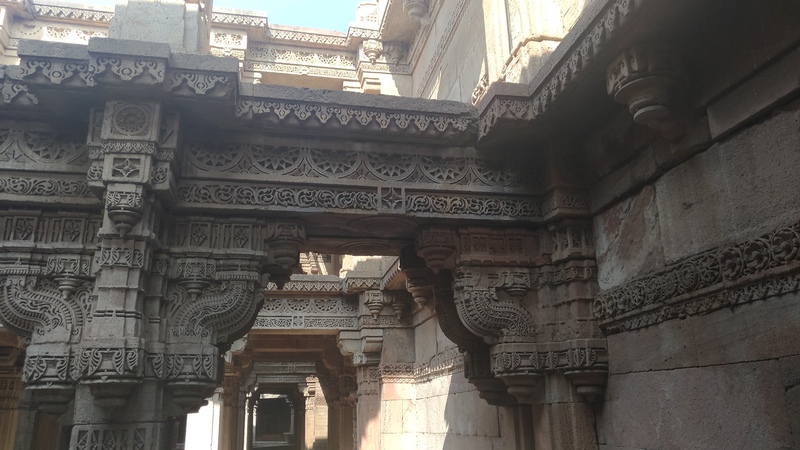 The unique architecture of the Step Well ensures that the interiors are almost 6 degrees cooler that the exteriors. 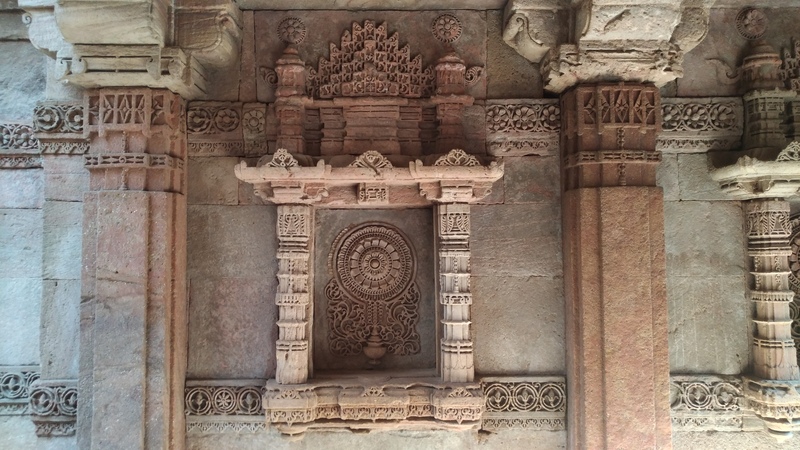 The walls and columns of the Step Well are adorned by patterns and motifs that depict the fusion of the Indo-Islamic works of art. The story written above gives reasons for the same… construction of the Step Well was started by a Hindu and completed by a Muslim king. 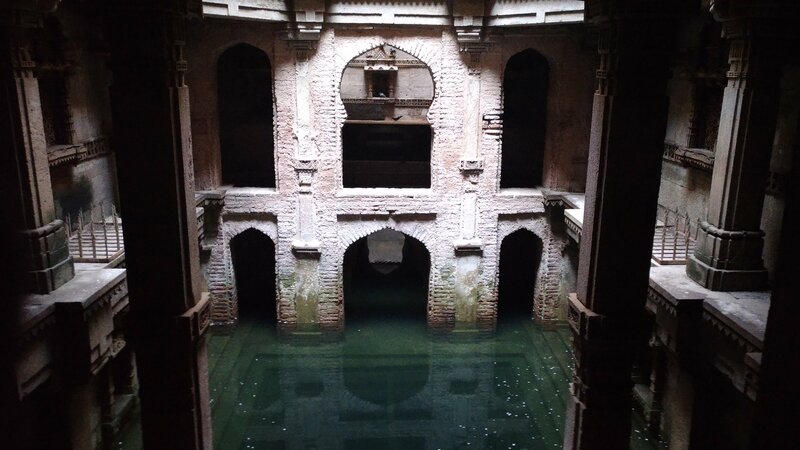 The Step Well served a ‘guest house’ for travellers and traders and was of great importance to a city, which wanted to be on the trade route. 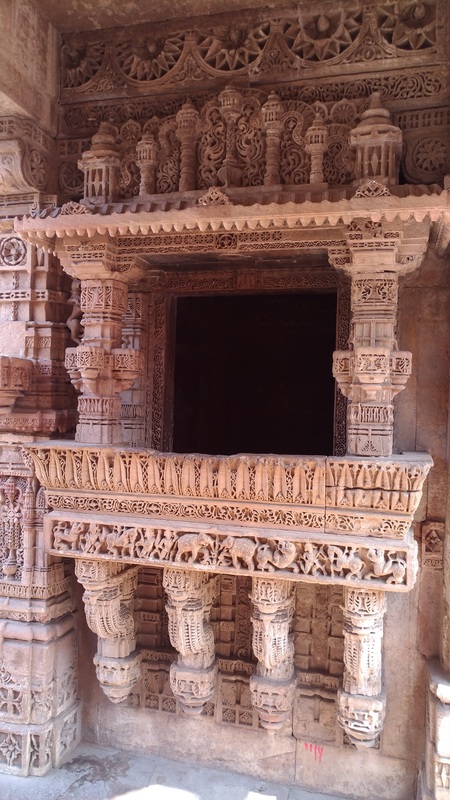 Women of the surrounding areas made the Step Well a meeting point… possibly akin to the modern day ‘Kitty Party’. 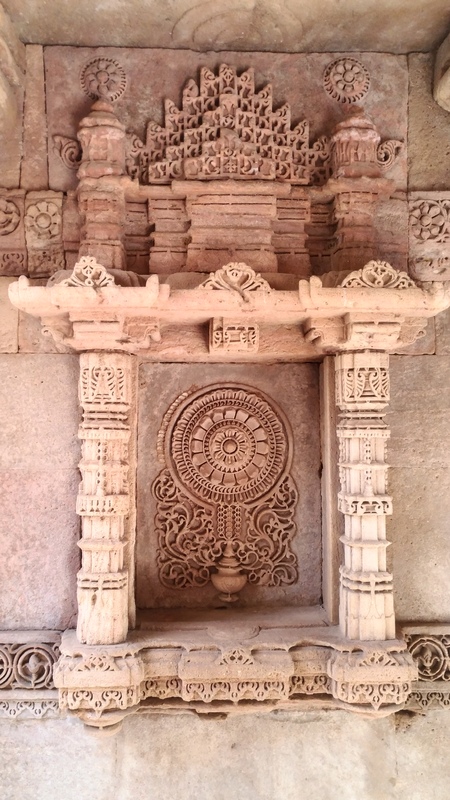 If you enjoy historic works of art, the Step Well will sure appeal to you. If you do intend to go here, avoid visiting on a Sunday… it’s way too crowded to get any good pictures. It would be best to visit early in the morning, when tourists have reached this place. The gates are open form 8 am to 6 pm… ideally, be there by 8 am and you will surely beat the crowds! If you do go here during the winter months, carry a picnic basket and spend some time in the gardens, soaking in the winter sun. We used the Asus Zenfone 3 to click pictures for this post and were throughly impressed with the camera! ASUS PixelMaster 3.0 – PixelMaster 3.0 is the brand of the entire camera system in the ZenFone 3 series. It is a combination of advanced hardware – sourced from the industry’s best experts as well as developed in-house, coupled with proprietary ASUS software tuning and tweaks. This provides the phone an ultra fast 0.03 sec autofocus. The photos and videos taken by the phone are steady, thanks to the 4-axis optical image stabilisation for photos and the 3 axis electronic image stabilisation for videos. We were especially impressed with the life like quality of the images, that need no filters and postprocessing…the colour correction sensor takes care of everything without any manual intervention! We also used the phone to shoot some 4k videos, which can be viewed below. Its great to have a device geared for future technologies. The Asus Zenfone 3 is a great phone for those who want a smart phone that doubles up as a smart camera! How to reach Galapagos from India?